FALLS CHURCH, VIRGINIA – November 8, 2018 – Evans Incorporated, the leading provider of human-centered organizational and operational consulting solutions, is proud to announce its won the Program of the Year category in the 2018 Greater Washington Government Contractor Awards, for work executed by its PropelUAS® division with the Loudoun County Sheriff’s Office (LCSO). Evans Incorporated was also named a finalist for Government Contractor of the Year ($25 million) at the awards gala, which took place on November 5, 2018. 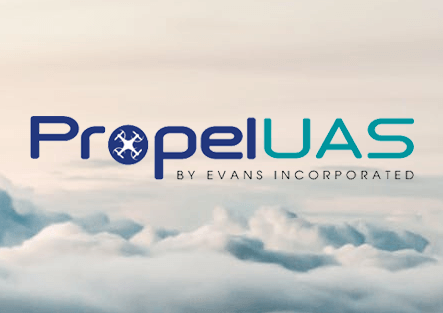 After years of supporting the Federal Aviation Administration (FAA), with the integration of UAS into the National Airspace System, Evans Incorporated created PropelUAS in response to the federal government’s increased use of flying drones and technological advances. PropelUAS partners with organizations to assist in navigating and integrating innovative, cost saving UAS technologies into their organizations. executed was the Loudoun County Sheriff’s Office (LCSO)’s “Project Lifesaver” program. The program featured drones, which use electronic tracking to locate people with medical conditions such as autism or Alzheimer’s who may wander away from home. PropelUAS helped the LCSO obtain their FAA drone pilot certification and oversaw training. Since the launch, the LCSO has rescued several individuals, including a 92-year-old man, located within 20 minutes of deploying the drone. Evans Incorporated is an industry leading consulting and solutions provider, specializing in human-centered solutions. Our solutions and products are designed to assist specific challenges related to organizational effectiveness, technological integration, or strategic growth, with a unique, human-centered approach. Organizations succeed because of people, who should be engaged as individuals to help them understand and prepare for the positive and negative impacts of disruption. For more information, please visit www.evansincorporated.com. leveraging 20+ years of aviation industry expertise in its dedicated team of unmanned systems, air traffic control, aviation training, human factors, and airport experts. PropelUAS® is an innovative ‘translator’ across the UAS program implementation process and navigates regulatory considerations to maximize outcomes. For more information, please visit www.PropelUAS.com.